If you are tired of the same old Christmas Grottos in Liverpool the forget them this year and do something different that’s entertaining and exciting. It’s time you looked at Mulholland Singing Diner where we’re bringing something fun and festive for you to do with the little ones this Christmas. Far from all the usual Christmas grottos in Liverpool, Mulholland Singing Diner will be a wonderful one-off Christmas experience unlike any other as we welcome Santa and his Singing Elves on various dates during the festive season. The Elves at Mulholland are a group of vocally gifted individuals who live to entertain. 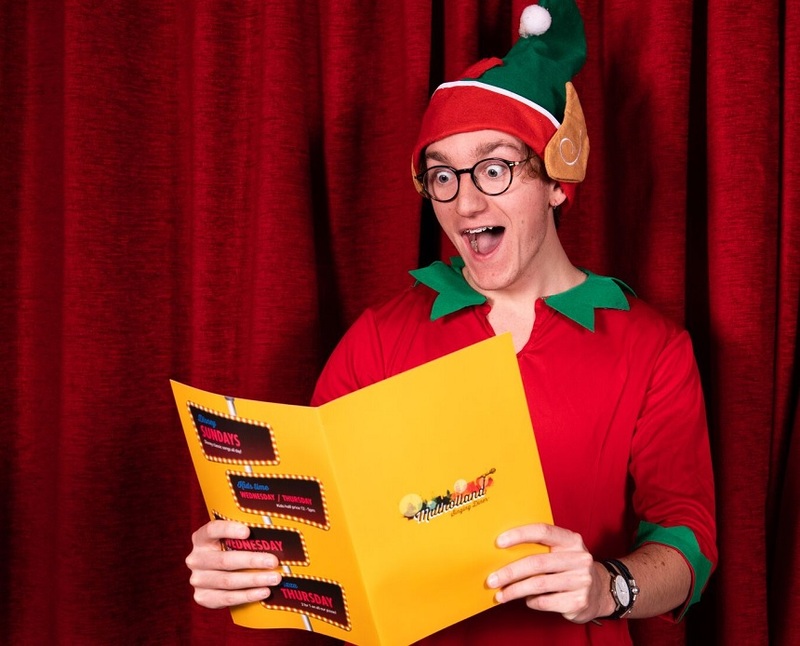 They’ve donned their elf costumes for the festive season and are ready and waiting to dazzle their audiences, getting everyone involved in a thoroughly festive sing-along. During the sing-along grab some yuletide grub and fill your faces with truly tasty treats, then cosy in for a seasonal storytime. When everyone’s bellies are full, the event will be wrapped up with a special visit from Santa who’ll be happy to hear everyone’s Christmas lists. So, have your list at the ready and remember to be good boys and girls, you don’t want to end up on the naughty list this year, do you? Throughout the year, Mulholland Singing Diner is filled with the sound of music. You can take your family and friends along and enjoy singing along to all your favourite musical movie hits from Disney songs to modern musical marvels and all the classics. As well as the knock out live performances provided by the talented serving staff there’s also a massive menu made up of some fabulous food and delicious drinks. 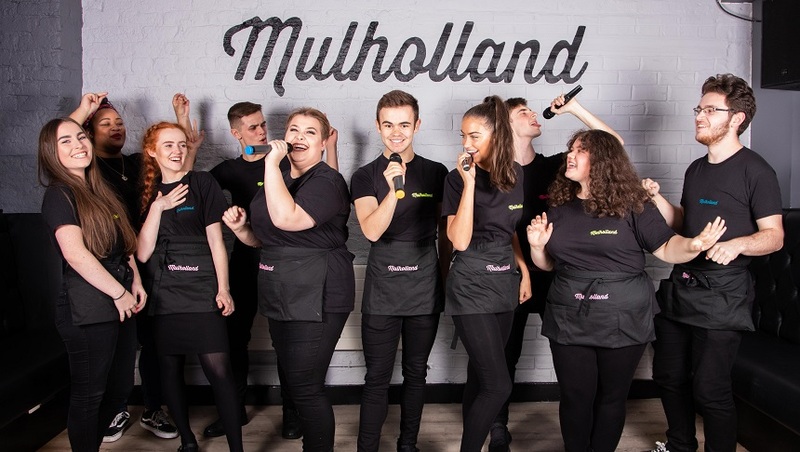 The first of it’s kind in the UK, Mulholland Singing Diner is an exciting place to eat in Liverpool where exceptional live entertainment is packed into each and every visit. Better still, why not make a city break of your visit and stay in Arthouse Hotel which is just above the diner. Book your family into one of the magical movie-themed hotel rooms inspired by some of the greatest classical musicals of all time. Our Sound of Music room invites up to six guests to stay inside a luxurious golden space which will capture your heart in the same way the movie did the first time you watched it. 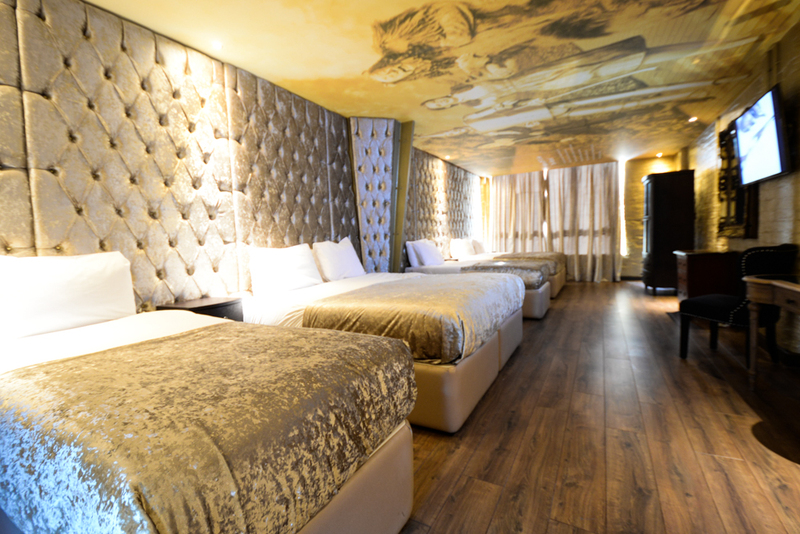 In our Wizard of Oz room, you and your group can enjoy an enchanting stay in Liverpool after enjoying all the festive fun at Mulholland. Have a cosy night’s sleep in one of the three double beds and enjoy the whimsical décor of inspired by the hit musical movie. Both of these amazing Liverpool hotel rooms come equipped with kitchenettes, double jacuzzi baths and are located directly above the Mulholland Singing Diner meaning the magic never stops from the moment you set foot in Liverpool. Call 0151 601 8801 or email info@signatueliving.co.uk for more details of Santa and the Elves and to book your overnight break in Liverpool. Santa Claus is coming to town and he’ll be paying a visit to Mulholland Singing diner, just make sure you are there to greet him this Christmas in Liverpool. Do you love musicals, enjoy singing along to your favourite tunes at any given moment and adore tasty food too? Come along to Mulholland Singing Diner, the ultimate musical experience in the heart of Liverpool. Join us and our dazzling singing waiters as they serve up tasty American food and million dollar shakes, alongside a spectacular soundtrack of hit musical numbers, 80s power ballads and much more. The UK’s first singing diner, Mulholland captures the sparkling atmosphere of Broadway. At Mulholland Singing Diner, our waiters are far from ordinary. Liverpool is renowned for being the home of some of the best musical talents around, that’s why it comes as no surprise that 16 of Liverpool’s best singers are ready to perform for you at our diner! Each of our talented servers were handpicked to showcase their talent at this unique new musical experience. All have with either performed in musical theatre shows and stage productions, or are currently studying at various performing arts colleges across Liverpool including LIPA, Liverpool Theatre School, RARE, John Moore’s University, Van Netten school of performing arts and MAD. Lucky guests can expect to hear a range of tunes, from famous movie soundtracks, to 80s power ballads, Disney hits and magical musical numbers. Plus, if you’re a die hard Disney fan, come along to our Disney Sundays and enjoy all your favourite hits sung live! 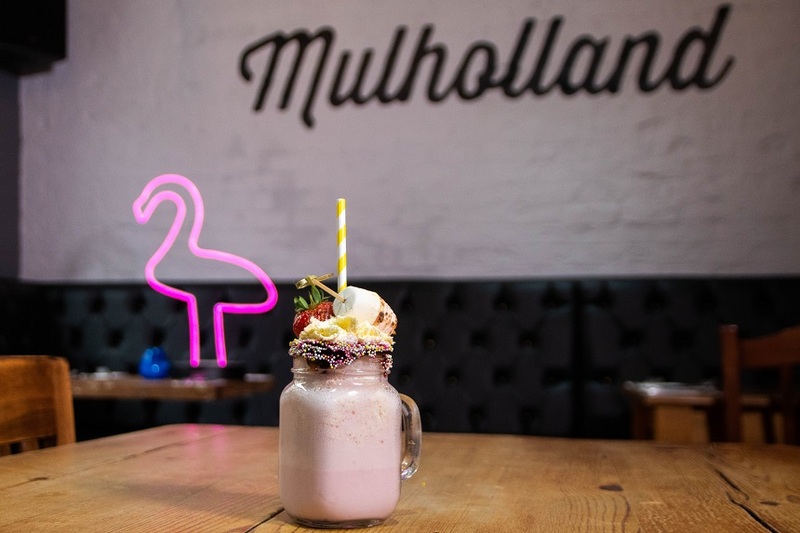 From Naked Milkshakes, to Tipsy Milkshakes and Cake Milkshakes, it’s fair to say Mulholland is the number one destination for shake lovers! Whether you love a boozy tipple or one bursting with sweetness and flavour, we have the perfect, refreshing drink for you. Try our Mint Choc Chip, made up of Sailor Jerry’s spiced rum, vanilla vodka, crushed Oreos, milk and cream mixed together with hundreds and thousands and whipped cream Maltesers. Or, if you’ve got a major sweet tooth, tuck into one of our spectacular Cake Shakes. Choose from either chocolate, vanilla or strawberry milkshake, topped with a chocolate or strawberry doughnut, drenched in a cream and caramel sauce and sprinkled with hundreds and thousands. Of course, it’s not all about the million dollar milkshakes, we also have an extensive cocktail list. From classic mixes like the Cosmo, Daiquiri, Margarita and Long Island Iced Tea, to our house specials, we know how to shake up a storm. Why not indulge in the Butterscotch Martini, featuring Butterscotch Schnapps, Baileys and fresh milk shaken into a chilled martini glass with a yummy hundreds and thousands chocolate rim. If all those cocktails and shakes has got you feeling peckish, look no further than the delicious Mulholland food menu. Inspired by the great American diners across the pond, our tasty menu includes some the classic dishes that make everyone’s mouths water. 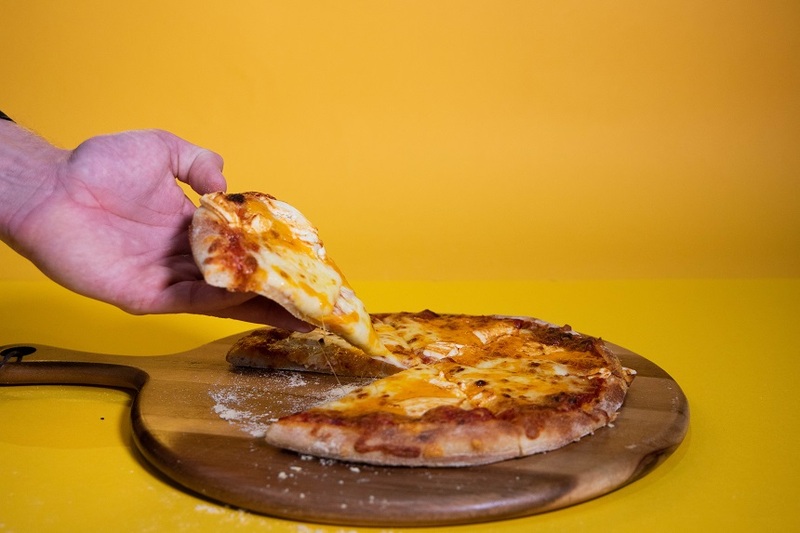 From scrumptious pizzas, to loaded hot dogs, stacked nachos and stuffed wraps, we really know how to treat you. And of course, Mulholland has music running through its foundations, so our food menu celebrates that! Each dish on our menu is named after one of our favourite songs, musicals, films, artists or characters, but with a fun foodie twist. 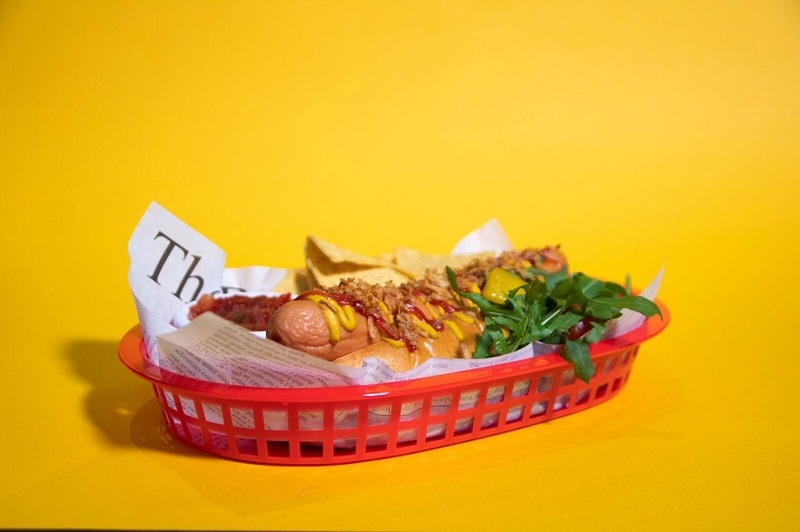 There’s the Bare Necessities, a delicious Bockwurst hotdog topped with ketchup, French’s American mustard and crispy onions. Or our Somewhere Over the Rainbow nachos featuring multicoloured nachos with cheddar cheese, sour cream, salsa and guacamole. 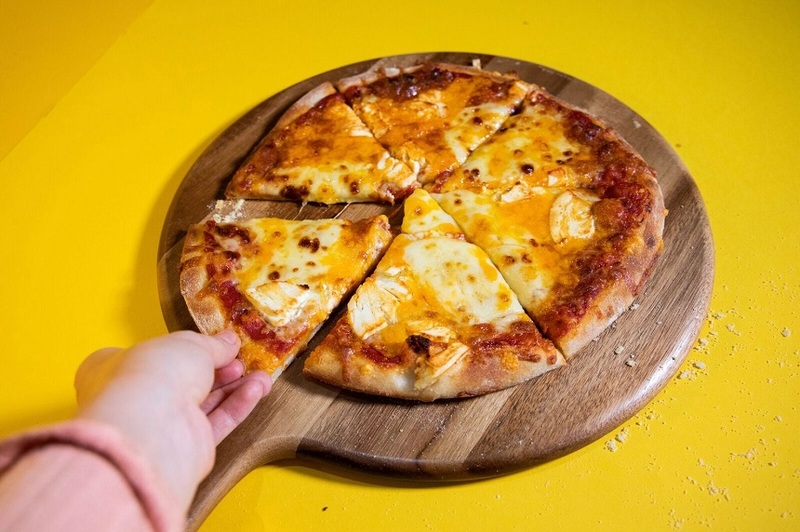 If you really fancy a pizza, why not grab a slice of our Spice Girls pizza? You can go for the Baby Slice which is our four cheese, or the Scary Slice, topped with chorizo, pastrami and sweet chilli peppers. Posh Spice is a tasty combination of goats’ cheese, caramelised red onions, spinach and chilli flakes, or try steak, pepperoni, red peppers and BBQ sauce if you love Sporty Spice. Last but certainly not least, Ginger Slice features all thing red, pepperoni, peppers, tomatoes and red Leicester cheese! It wouldn’t be a trip to a classic American diner without a huge dessert to end the meal, and at Mulholland we offer some of the most mouth-watering in Liverpool. Choose from the Hopelessly Devoted to Goo, homemade brownies with ice cream and chocolate sauce. Or maybe, Do you Waffle Build a Snowman? A yummy mix of waffles served with banana, cinnamon sugar, caramel sauce and ice cream. As you can see, at Mulholland Singing Diner we really know how to put on a show. From truly dazzling entertainment from our marvellous singing waiters, to the indulgent million dollar shakes and heavenly food menu, you’re sure to find something to tingle your taste buds. If you’re in the mood to sing and be sang to, book your table for Mulholland Singing Diner. Give us a call on 0151 305 7900 or email us at book@mulhollandsingingdiner.co.uk. Follow us on Facebook to stay up to date with all of our amazing offers and themed nights. There’s A Whole New World launching in Liverpool and it’s the perfect place to host a birthday party for any Disney-loving kids or musical-obsessed teens. 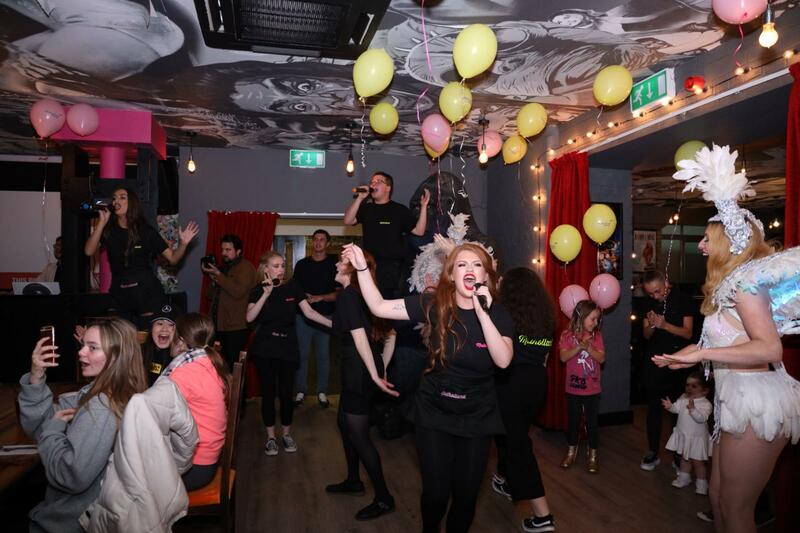 Go The Distance this year and give your child a birthday party they’ll never forget at the UK’s first singing diner in Liverpool. 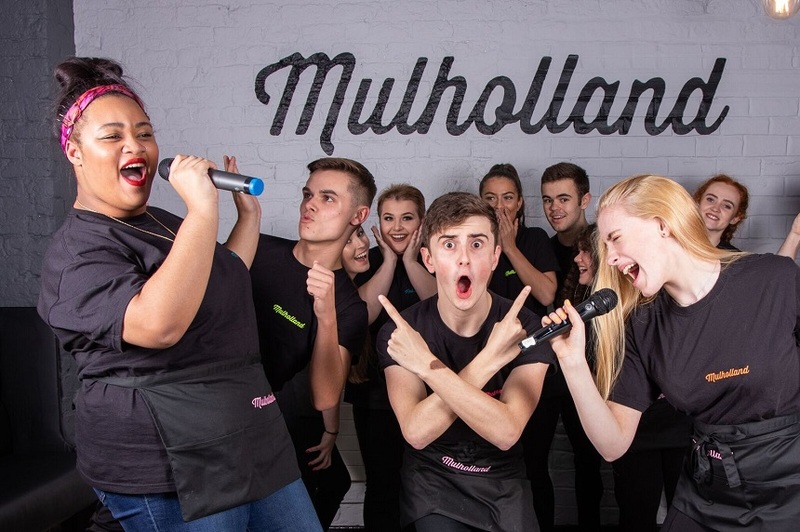 Prepare to be star-struck at Mulholland Singing Diner as our showstopping waiters take you on a musical journey through Disney hits, musical favourites and movie number ones. Capturing the sparkling spirit of Broadway, Mulholland is the ultimate birthday party venue for kids everywhere, offering delicious food, incredible entertainment and a chance for everyone to Let It Go! Join us for a pitch perfect musical experience in the centre of the city – ideal for a kids’ celebratory day out or unforgettable evening meal. From famous movie soundtracks to the very best 80s ballads for all the family to enjoy, our incredible waiters will have you singing along in no time as they serve up delectable state-side meals and million-dollar shakes for a birthday party like no other. The perfect experience for a little star in the making, or a wannabe girl-group looking for a fabulous day out, Be Prepared to be wowed at this exclusive dining experience in the heart of Liverpool. Whether you’re a musical fanatic or you’ve only watched one Disney movie, there’s something for everyone at Mulholland Singing Diner. After all, There’s No Business Like Show Business so book your table now to enjoy a sprinkle of stardust on your little one’s birthday celebrations. Teen parties can get stuck into a state-side menu, full of classic American favourites and unique Mulholland specialties (all with a musical touch). Be Our Guest as you pick from multi-coloured nachos, musical-themed hot dogs and Spice-Girl based pizzas plus much, much more. Why not enjoy our Do you waffle build a snowman? Or tuck into The Greatest Showman Sundae packed with brownie pieces, ice cream, marshmallows, a side of candyfloss and All That Jazz? Our service is Greased Lightnin’-special with a side of musical accompaniment, so there won’t be a dull moment once you step inside our Seel Street set. And for younger movie-stars, our kids menu offers all the fun in smaller portions: pick from sandwiches and wraps, two-topping pizzas and delectable ice-cream treats to fill hungry mouths. 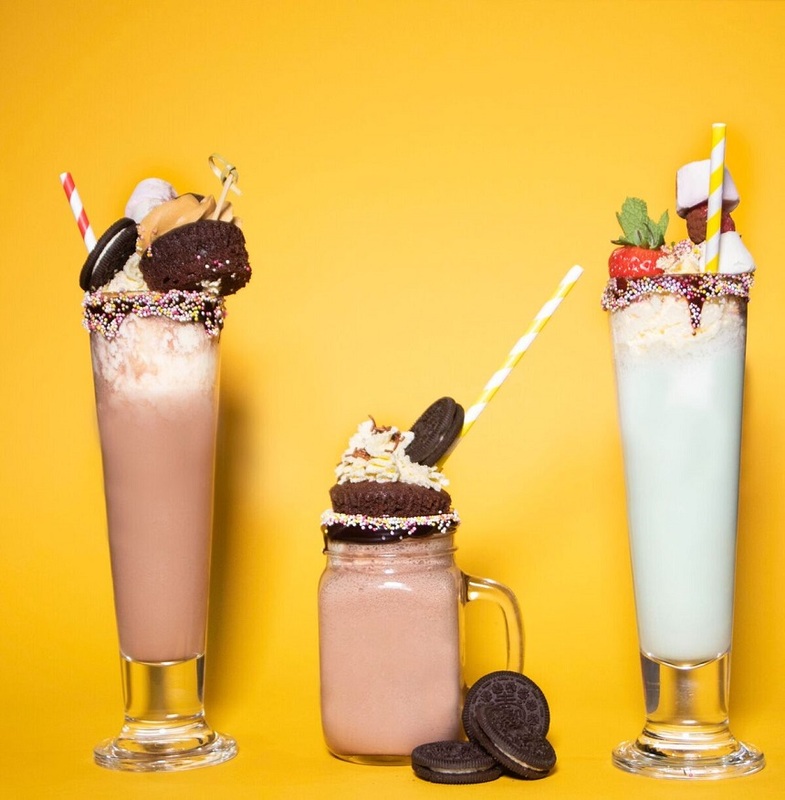 And of course, a diner isn’t a diner without milkshakes galore – and at Mulholland, no kid’s party is complete without one of our million-dollar shakes. You’ll love our Cake Shakes that seem to be Defying Gravity with their sumptuous toppings of cream, doughnuts, hundreds and thousands and sweet treats! Dial up the movie-mania for an ultimate film-themed birthday experience with a stay in one of our eclectic Arthouse Hotel suites. Sleeping up to 12, these luxurious rooms are perfect for children’s parties, offering plenty of space for excitable party guests and incredible in-room amenities such as flat-screen TVs, jacuzzi baths and even pools! Situated on Seel Street, Arthouse Hotel is a unique hotel with stylish rooms inspired by films including Mary Poppins, the Wizard of Oz, Grease and the Sound of Music. Check out our incredible packages today for unmissable deals to make your child’s birthday the ultimate movie experience. To book a children’s party at Mulholland Singing Diner or an Arthouse Hotel room, call our team today on 0151 205 7900.